I’m sitting here trying to think of something brilliant to say about Spaghetti Squash Sausage Lasagna. But all I can think about is the very VERY loud snoring that is coming from Theo. (Btw, Theo is our six-year-old little pup.) The poor thing has the smallest little nostrils you ever did see. His genetic make-up makes him prone to snoring but still. He’s loud. He’s been especially bad lately. Last night I got in bed (Theo sleeps under a chair in our room, and Mike was already snoring sleeping) and I laid there and listened to him. But the funny thing…is that it doesn’t bother me. I smiled and fell asleep. If he were human, I think I would have kicked him out of the room. ha. Ok, he just stopped snoring. Ya’ll know how much we love spaghetti squash from my recent Spaghetti Squash and Cheese post. 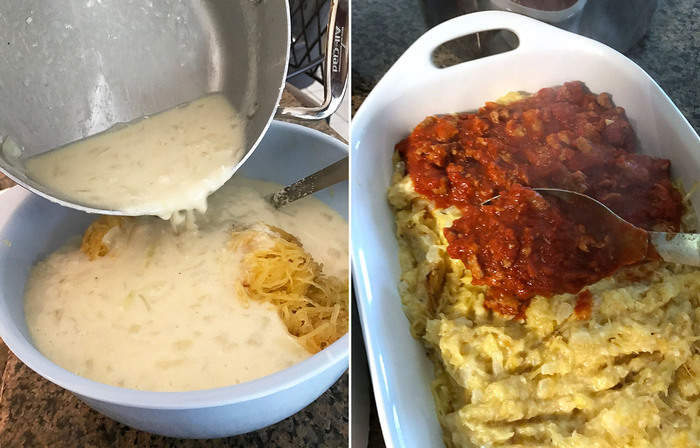 I actually used the base of this recipe (changed quantities and type of cheese) for the “noodle” layer of my Spaghetti Squash Sausage Lasagna. (Say THAT five times – fast.) 🙂 The base involves a roux that helps everything stick together, like lasagna tends to do. And no, spaghetti squash does NOT taste like pasta noodles. But it’s a very tasty replacement. And healthy. The spaghetti sauce layer is pretty typical of anything I’d use for a red sauce. I used Jennie-O lean turkey sausage links and squeezed the sausage out of the casings. The rest of the ingredients are basically crushed tomatoes and spices. This sauce is super easy and homemade! No Ragu or Prego here. Don’t let the number of ingredients in this recipe scare you. It’s seriously not difficult to make. At all. 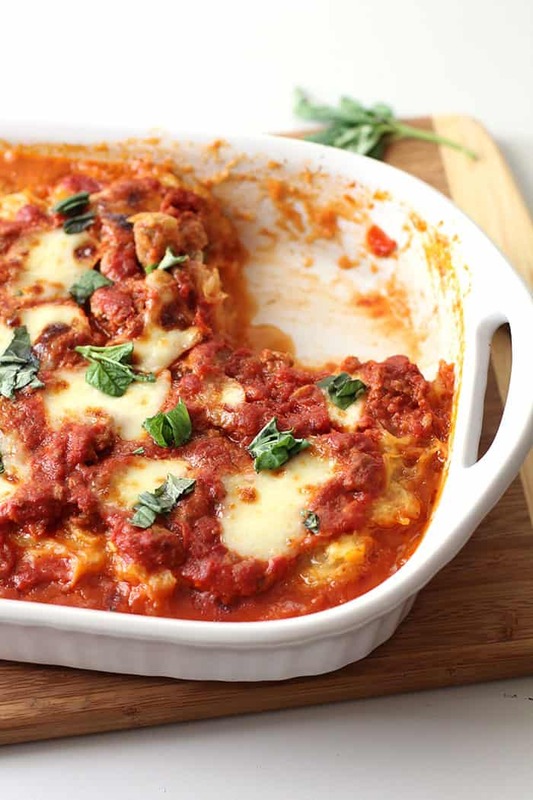 It really isn’t necessary to “layer” this lasagna. 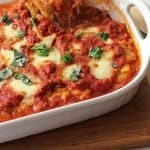 You just put all of the spaghetti squash mixture in the bottom of the pan, top it with the red sauce, and add a bit of fresh mozzarella and basil to the top. Easy peasy. Preheat oven to 400 degrees. Cut the spaghetti in eight pieces and remove seeds. Arrange on baking sheet lined with parchment paper and drizzle with olive oil, kosher salt, and freshly ground pepper. Bake until tender, approximately 45-50 minutes, or until fork tender. Let cool slightly, and then "comb" the strands out of the peel with a fork. 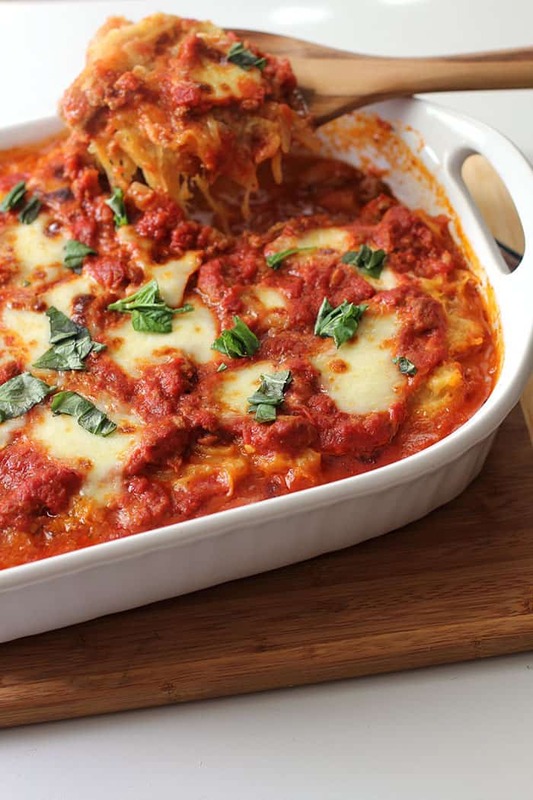 Set spaghetti squash aside. Heat a large saucepan over medium heat. Add butter and when melted, add diced onion. Sauté for 5-6 minutes or until soft. Add garlic and stir for another minute. Stir in flour and combine, stirring constantly for a few minutes. Then turn heat up slightly and add chicken broth and milk. Continue whisking until the mixture becomes thick, approximately 10 minutes. Add salt and pepper to taste. Remove pan from the heat and add shredded mozzarella cheese and parmesan cheese. Stir until melted. Set aside. Heat a large saucepan over medium heat. Add the olive oil and turkey sausage and cook until browned and crumbled. Add garlic and stir for about a minute. Add the crushed tomatoes, the sugar, bay leaf, water, and the spices (salt, pepper, crushed red pepper) and simmer for 20-30 minutes. Spray a 9x13 casserole dish. Layer all of the spaghetti squash mixture and then all the spaghetti sauce mixture. Top with fresh mozzarella cheese, parmesan cheese, and basil. Cover with foil and bake for 30 minutes on 350 degrees. Remove foil and bake for another 10 minutes, or until cheese is nice and brown. Let the lasagna sit for 15 minutes before serving. Hi. This sounds good..I am going to make this, but am going to swap out the spaghetti squash for zucchini noodles. We are on a no or low carb diet, my honey needs to !wow 25 lbs more, so he can have knee surgery. He has lost some, but recipes like this will help. Thank you! I love the a Turkey concept! This was just what I was looking for!